LED Up Lighting can turn an ordinary event into something spectacular bringing together sights, sounds, & tastes into a symphony of excitement. Lighting sets the tone of your event from the instant guests arrive bringing bigger than life proportions. 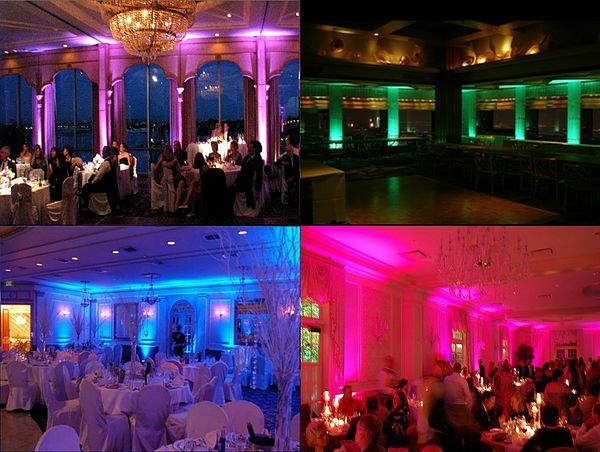 Lighting used to be extremely expensive, now it is a special event necessity. You’ll appreciate our expertise, multitude of options and ideas to take your event to the next level with custom lighting. “Up Lighting” or “up lighting”, gets it’s name from the direction of the beams of light that are projected on to a wall or other surfaces. Usually several fixtures are placed at a low position around the room, at the bottom of a wall or a set of columns for example. The lights are pointed UP so the corresponding beams of light highlight the wall and shoot towards the ceiling. The effect can be quite dramatic and can help define a space and add color as well as dimension to an area. Up-Lighting is especially useful when there are no decorations allowed on the walls, where there is little or no ambient light or an area that needs to stand out from its surroundings. This package includes (10) Wireless LED fixtures – $350. Any Color of your choice for Up To 6 Hours – We Deliver, Set-Up & Pick Up. This package includes (15) Wireless LED fixtures – $450. This package includes (20) Wireless LED fixtures – $500.